The History of Dental Implants - Dental Brothers in the future. Known as osseointegration, it means that the implant fuses to the bone and is not rejected by the body. Ancient people weren’t the only ones experimenting with dental implants and other repairs. 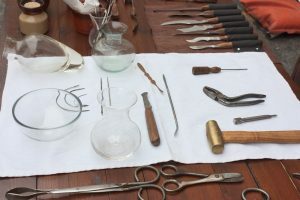 Between the 1500s and 1800s, people purchased loose teeth from poor people or took them from cadavers in an effort to replace their missing teeth. These attempts failed due to infections and the body’s rejection of the teeth. Over time, doctors and scientists began to look for more permanent and successful solutions than taking teeth from other people. In 1886, a porcelain crown was mounted on a platinum disc. It was rejected by the body but it was one of the first attempts at a more standardized dental implant. By 1913, doctors were still working on the problem of a dental implant that could fuse itself to the bone. Dr. EJ Greenfield developed the first implant that’s most similar to the kind used today. It was a platinum and gold cylinder referred to as an “artificial root.” In the 1930s, two doctors, Alvin and Moses Strock, experimented with a chromium-cobalt alloy known as Vitallium to restore individual teeth. Again, due to lack of osseointegration, their efforts were unsuccessful. In the 1950s, dental implant capabilities took a big step forward. Dr. Per-Ingvar Branemark, an orthopedic surgeon, was studying bone healing and regeneration when he made a startling discovery. He tried to remove a titanium cylinder from the femur of a rabbit and couldn’t get it out. Bone had grown around the titanium and fused to it. Properties within titanium allow osseointegration to take place. In 1965, Dr. Branemark placed the first titanium dental implant in a human volunteer. This push forward sparked rapid research, development, and improvement in dental implants. Modern dental implants use a screw made from titanium alloy. It’s usually roughened surface to make it easier for the bone to fuse to it. A screw is attached to the jaw where the tooth used to be. Once that heals and the screw and bone have grown together, a post with a crown on top is inserted. This is the dental implant most people are familiar with today. The man has been inventing and innovating based on our needs since the world began. It should come as no surprise that dental health has been a part of that inventive journey. When you know where people began in their efforts to implant new teeth, it makes the titanium dental implants used today that much more impressive. 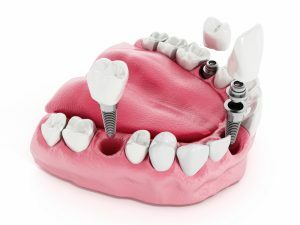 ingenuity and an unwillingness to give up, dentistry have solved the problem of dental implants.